Asian bourses were buffeted yesterday by a brewing Italian political storm, as local and regional equity markets continued their downward trajectory at the opening. When the dust settled, Singapore's Straits Times Index ended the day 2.1 per cent lower. Shanghai fell 2.5 per cent, Hong Kong dropped 1.4 per cent and Tokyo slipped 1.5 per cent. The worst performer in Asia was Malaysia's Kuala Lumpur Composite Index, which slumped 3.2 per cent to a near six-month low. Italian President Sergio Mattarella had rejected an anti-EU nominee for economy minister, setting the stage for elections later in the year that could put in place a parliamentary majority hostile to European institutions. Investors are worried that repeat elections in the euro zone's third-largest economy - which reportedly could be held as early as July - may translate into a de facto referendum on Italian membership in the euro and the country's role in the European Union. Sentiments were also hurt by US President Donald Trump announcing on Tuesday that he would proceed with tariffs on US$50 billion (S$67 billion) in Chinese imports and introduce new limits on Chinese investment in US high-tech industries, as part of a broad campaign to crack down on Chinese acquisition of US technology. A third dampener was the brewing crisis in Spain, where Prime Minister Mariano Rajoy may face a no-confidence vote after his party was found guilty in court of benefiting from illegal funds. Ratings agency Moody's hinted on May 25 that it may look to review Italy's debt rating, citing concerns over the two anti-establishment parties' fiscal plans that could ratchet up spending by as much as €100 billion (S$156 billion), according to reports by CNBC. Bank of Singapore's head of investment strategy Eli Lee highlighted that with the higher odds of fresh Italian elections, what was previously viewed by the market as mainly Italy-specific risks "now have larger implications on Europe" and "represent much greater stakes". The right-wing La Lega party is enjoying strong momentum and attempting to position the new elections around the issue of Italy's independence, with the spectre of "Italexit" continuing to haunt markets in the meantime, said Mr Lee, referencing a term popularised by nations wanting to exit the EU. 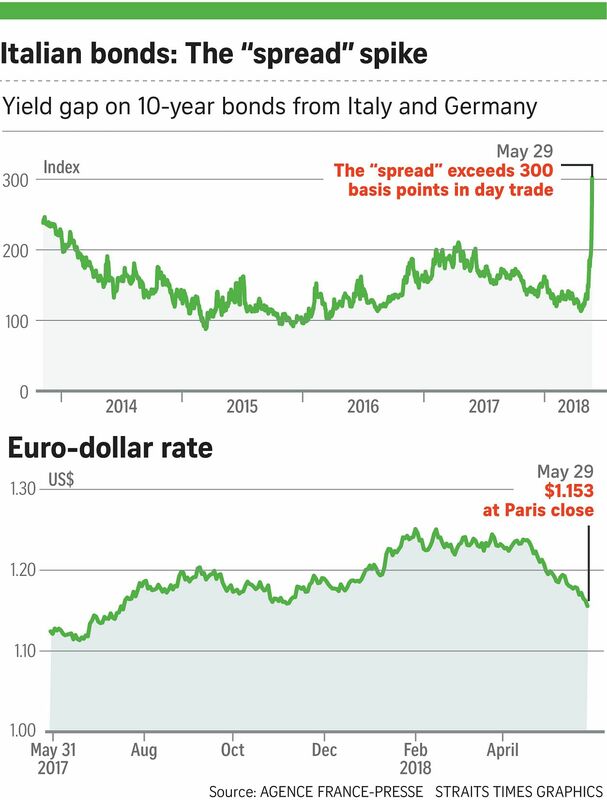 "While Italian equities make up less than 5 per cent of the Euro Stoxx 50, the widening of peripheral bond spreads often brings up euro existential questions, as we've seen in the past, and can lead to a spike in the European equity risk premium, which takes a heavy toll on overall markets," he added. On the foreign exchange front, the euro continued its tumble against the Singapore dollar, trading at S$1.5513. Against the US dollar, one euro fetched US$1.1535 against the common currency, its weakest since July last year. Comparing Italy's latest meltdown to the past Greek crisis, head of Asia-Pacific trading at Oanda Stephen Innes warned that it is "monumental by comparison". "Italy's economy is 10 times the size of Greece's, not to mention it is burdened with the fourth-most massive public debt in the world. And given an imminent Italian election may very well amount to a referendum on the euro, there is a flight to safety from European assets beyond the Italian borders," he said in a note, adding that European capital markets are "in chaos as it may end up being more than just Rome that is burning".